Sunday November 19, 2017 at 2:30pm. Location- Trinity United Church, Bobcaygeon. This male quartet performs a variety of Celtic music, including Scottish, Irish and East Coast songs. Stewart Bennett, Fred Cotie, Ian Forbes and Herb Vine make up this unique vocal quartet. They are accompanied and directed by Lynn Swanson. 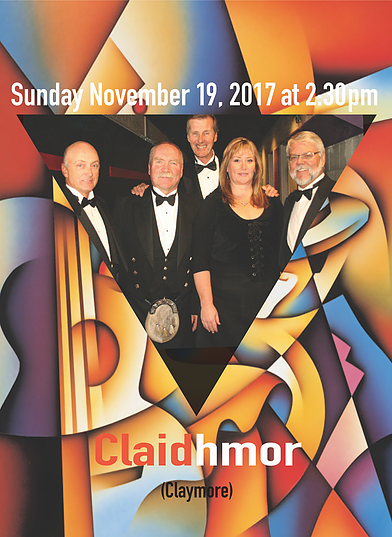 Based in Durham Region, Claidhmor has been featured at Highland Games, Annual Burns Suppers, Corporate Events and private functions throughout the GTA. They have been privileged to perform at some great venues including Roy Thomson Hall, Richmond Hill Performing Arts Centre and the Rogers Center (formerly SkyDome). Dressed in their kilts, Claidhmor lends their harmonies and passion to each song they sing and are always ready and willing to perform at any gathering, large or small.